The night sky is full of objects to see and wonder at, and we astronomers know that. No matter how long you've been stargazing, there's always something new to point your telescope at. Take, for instance, the Virgo Clus﻿﻿ter. It's one of the richest places in the night sky, in terms of the number of objects it contains (over 1200 galaxies according to the table on this page). 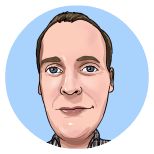 However, any​ meaningful observation of the cluster requires a good knowledge of it. This guide helps you with that. In it, you'll learn everything you need to know to plan your own session of viewing many of the galaxies in this group... and discover some little-known elements of it to share with your astronomy club. 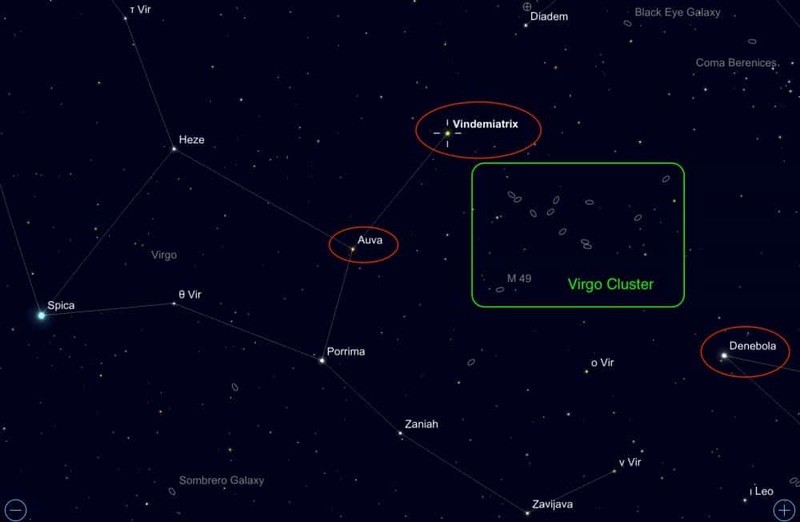 The Virgo Cluster is a conspicuous object in the night sky. It's also the farthest object from our galaxy which has a physical connection with us. It is a gigantic cluster of galaxies found in the constellation of Virgo. Another such cluster is the Local Group, which our own Milky Way and the Andromeda Galaxy are part of. 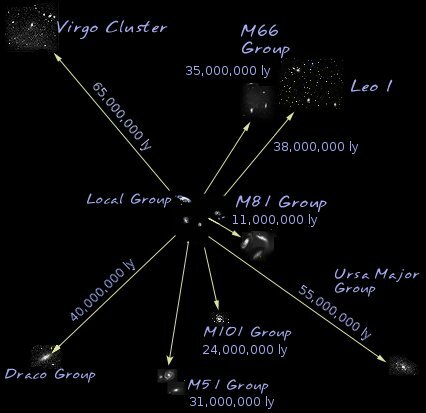 Our Local Group and the Virgo Cluster are a part of an even bigger object - The Virgo Supercluster. This enormous object is bound together by the collective gravity of the constituent galaxies and spans an unimaginable 110million light years of space. If your mind is not blown yet, it will be when you learn that the Virgo Supercluster is just one of 10 million superclusters in the observable universe! Let's drill back down to the more manageable Virgo Cluster. Although it is vast, it is also a very long way from here - around 53million light years, in fact. So, in our sky, the entire cluster fits in an area about 8 to 10 degrees wide. Virgo A has M87 at its center (source). An unnamed cluster surrounds M86 (source). Virgo B has the brightest galaxy, M49 (source). All three subclumps are slowly falling into each other under gravity and will eventually form one single cluster. M49, M86 and M87 were first cataloged by Charles Messier (although he thought they were nebulae) along with 13 other galaxies. He made note of them in the 1770s and 1780s, so it's a safe bet that your telescope is better than his. With that in mind, good seeing, a dark site, and a scope of around 6", it's not unreasonable to target seeing 20 or more of the galaxies in the Virgo Cluster. You can buy our ready-made observing list of the brightest 30 galaxies for just $1.99 - compatible with Sky Safari 5. With our target set, let's get into how we're going to achieve it. We'll begin with finding the Virgo Cluster in the night sky. The brightest element in the galaxy cluster is M49, with an apparent magnitude of 9.3. This is well beyond even the best eyesight and so you will need to make use of a telescope to enjoy any of the galaxies in the cluster. You will get best results using an eyepiece with a wide field of view. Something like this Orion 20mm Plössl on Amazon has 52° apparent FOV and is a great price. If you have more cash (this next one is 4x the price on Amazon of the Plössl) then Orion's 17mm Stratus eyepiece yields a 68° FOV and fits both 1.25" and 2" scopes. Finally, for finding your way around, you can't go wrong with a red flashlight and Sky & Telescope's Pocket Sky Atlas. This has a dedicated page for the cluster with good - but not overwhelming - levels of detail. Finding galaxies in Virgo needs a simple application of the star-hopping technique, or a goto telescope programmed with the coordinates (which you can get for Sky Safari 5 here). Additionally, it will be useful to have Stellarium or Sky Safari 5, which the following screenshots come from. You can also use the essential Pocket Sky Atlas, which has a page dedicated to the Virgo Galaxy Cluster. Let's begin. First, you'll need to spot the Virgo constellation. Leo will be right beside it. Locate these three stars: Auva and Vindemiatrix in Virgo and Denebola in Leo (circled in red, below). These are the loose boundary for the Virgo Cluster of galaxies and make the perfect starting reference point. Before we (finally) get into looking for individual galaxies, there is one other observing challenge you should know about. Markarian's Chain is a line of 8 galaxies - all gravitationally associated with each other - that string out in an arc. 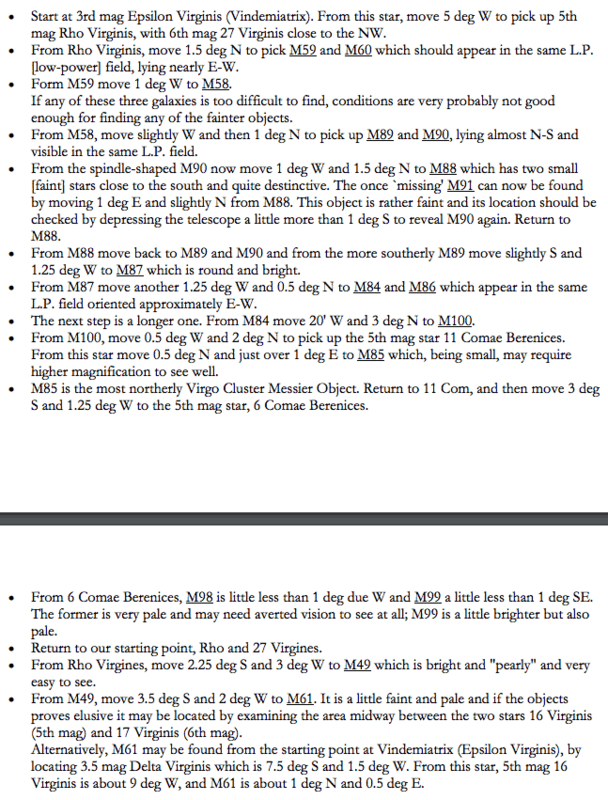 See the image below and note it includes M84 and M86. A wider field of view will show you many of them at once; using higher magnifying power when you have them in sight will enhance details. Markarian's chain also contains the Eyes Galaxies. 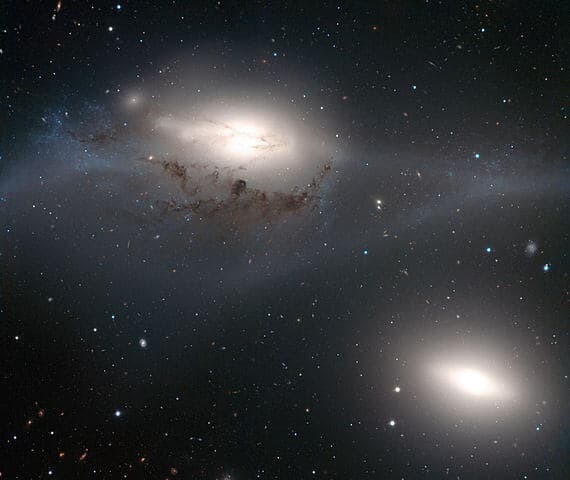 These are NGC 4435 and 4438. Together, they are bright, round galaxies named after two Greek words for 'eye': Oppa Virginis and Omma Virginis. This small chain of eight galaxies is a nice challenge for an evening's viewing and rewards with a glow of satisfaction when you 'bag' all of them. 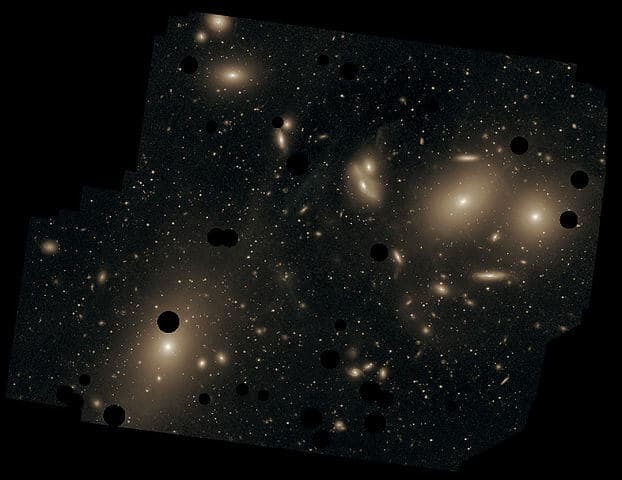 The eight galaxies of Markarian’s chain are included as a stand-alone observation list with our Sky Safari 5 Virgo Cluster list. More light is better, so bigger telescope apertures give better results than smaller ones. An 8" aperture will yield superior sights to a 6". As mentioned earlier, there are 16 Messier objects - all galaxies - in the Virgo Cluster. Whilst they are plentiful, and some are quite bright, don't underestimate the challenge of spotting individual objects. The challenge in seeing them comes from the fact they are mostly faint and they are close to each other. Through the eyepiece, they are not much more than grey, fuzzy patches (although a decent telescope filter can improve detail). Grab our pre-programed observation list for $﻿1.99. 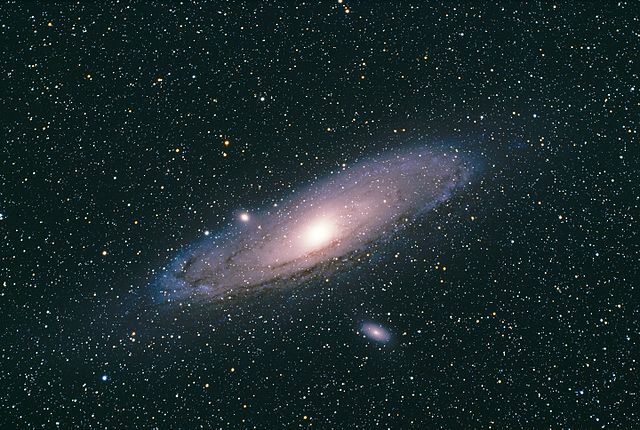 It covers the brightest 30 galaxies in the Virgo Cluster and is compatible with Sky Safari 5. Click the picture below to get a larger version. The Virgo Cluster of Galaxies is an area of our sky rich in relatively bright galaxies. In this article we've shared with you how easy it is to find the area, how vast it is and the unimaginable distances involved. 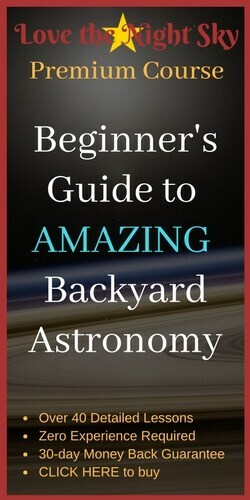 We've also shared the most important factor for any backyard astronomer: how to see it!